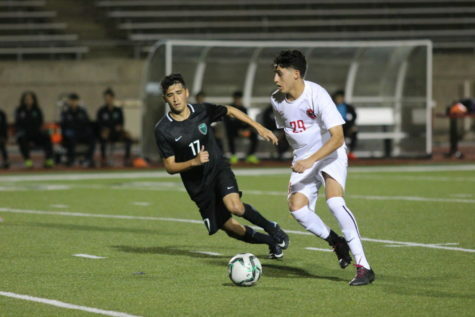 Coppell Cowboys senior midfielder Andrew Santillan looks to make a pass as Berkner Rams senior David Adame tries to steal the ball during the first half of the game on March 9 at Buddy Echols Field. 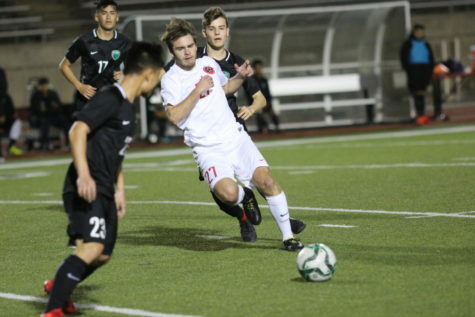 The Coppell Cowboys defeated the Berkner Rams 5-1. The Cowboys soccer team left the field satisfied with its 5-1 triumph over Berkner Rams on Friday at Buddy Echols Field. Now with 11 goals in the past three matches and a 9-1-2 district record, the Cowboys aim to overtake Pearce to lead District 9-6A. Coppell stuck to their traditional 4-3-3 formation, simple tactics and long balls to score, and also depended heavily on fast one-touch plays to get through the Rams’ midfield and defense. However, the Rams (3-8-1) played with a slightly different gameplan than the one in the last time they clashed using the target-man tactic. Basically, all forward balls were directed as a through ball to a single attacker up front, in this case, senior forward Abdulhakim Redi, who would then try to outrun the defenders. Coppell Cowboys senior forward Jared Gast makes a pass during the first half of the game on March 9 at Buddy Echols Field. The Coppell Cowboys defeated the Berkner Rams 5-1. The Cowboys put in their first goal thanks to a well-placed shot by senior midfielder Wyatt Priest in the 15th minute, giving them an early 1-0 lead. The Rams immediately responded with a long ball up front and a goal from Redi in the 16th minute to level the score at 1-1. The match saw heavy attacks and some very close chances by the Cowboys till the end of the first half, leaving them somewhat frustrated. Coppell almost scored in the 20th minute but the play was called offside after the ball hit the back of the net. Seconds later, a Berkner defender fouled junior forward Joe Reudi in the box just a second before the shot went in, disallowing the goal and giving a penalty kick to the Cowboys which later was saved by the keeper. The Cowboys went ahead in the 48th minute from a beautiful long ball from Priest to junior forward Adam Marez, who banged it in from outside the box, making the score 2-1. Just minutes later in the 53rd minute, Priest added another goal onto his record with a header, giving the Cowboys a comfortable 3-1 lead over the Rams. 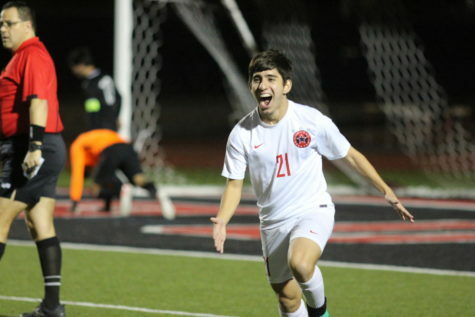 Coppell Cowboys senior striker Cesar Alves runs to celebrate with his team after scoring the final point during the second half of the game on March 9 at Buddy Echols Field. The Coppell Cowboys defeated the Berkner Rams 5-1. The Cowboys continued to score two more goals, a close ranged header in the 64th minute and a beautiful dribble past two defenders and a shot by senior Cesar Alves, closing out the match with a 5-1 score. The match saw a hattrick, an assist and plenty of crucial plays from Priest. Always a big part of the Cowboys formation and plays, Priest was awarded a well-deserved Man of the Match award for his splendid performance. 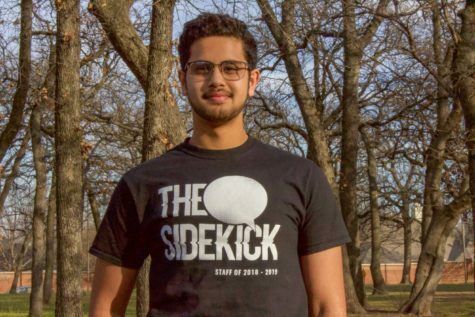 The Cowboys will have a chance at winning district if they win their remaining two matches against fourth-placed Skyline and eight placed Richardson and if J.J Pearce loses its next two matches. The Cowboys play Skyline at Buddy Echols Field 7:30 p.m on March 20.